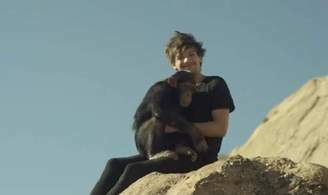 PETA (People for the Ethical Treatment of Animals) have contacted the boy band to express their concern about the primate and other wild animals, including a lion, which feature in the Steal My Girl video. The organisation claims that the animal trainer who provided the chimp, called Eli, for the shoot has violated aspects of the US Animal Welfare Act in the past. PETA is urging the group to pledge never to work with wild animals again and donate a percentage of their proceedings from the single to an animal welfare charity. However, the production company behind Steal My Girl, Fulwell 73, has defended its choice of trainer and said they vetted him thoroughly first. In a statement sent to Sky News, it said Steve Martin has had an exemplary and highly respected career for the last 44 years. It added that his animals have also worked on films such as The Bourne Legacy and the television show True Blood. The music video, from One Direction's new album Four, also stars the American actor Danny DeVito.